Platycodon 'Mother of Pearl' is a rare, pink balloon flower. It has large, pale pink flowers with deeper pink veins. The bushy plants are very floriferous, and the long-stemmed flowers are great for cutting. 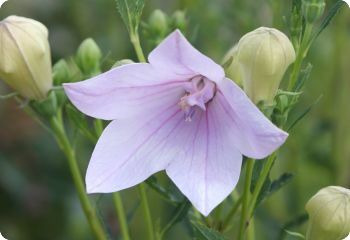 Balloon flowers are long-lived, reliable perennials once they are established. They bloom the first year from seed if started early indoors. Also known as Platycodon grandiflorus 'Perlmutterschale'. Deer resistant. Hardy in zones 3-9. Start balloon flower seeds indoors 8 weeks before the last frost date. Barely cover the seeds with soil. Full sun to part shade.